With the launch of the iPad Mini and 4th Generation iPad, iPad sales are set for another holiday surge. 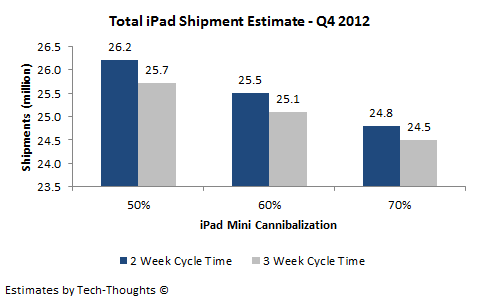 Since we've already estimated cannibalization & latent demand for the iPad Mini, we can use these as inputs for estimating total iPad shipments for Q4 2012. The above chart shows that iPad shipments would have reached 22.7 million units in Q4 2012, if the iPad Mini was never launched. 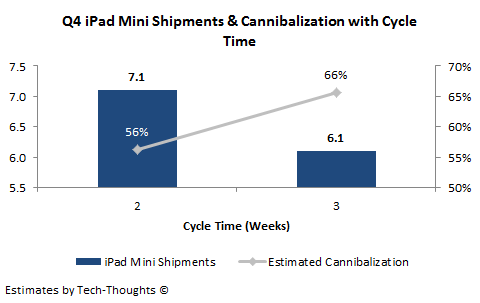 Based on the display shipment data above and a cycle time of 2-3 weeks, Q4 iPad Mini shipments should total roughly 6-7 million. The cannibalization estimates in the chart above are based on cannibalized latent demand from Q3. Actual cannibalization is likely to be in the same ballpark, but could vary slightly based on availability of the product to meet demand and greater consumer awareness about the iPad Mini. 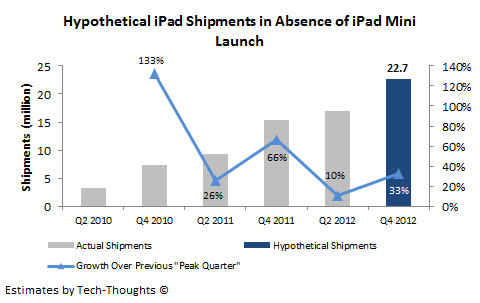 The chart shows that, depending on cycle time and actual cannibalization, iPad shipments should total between 24-26 million in Q4 2012, i.e. 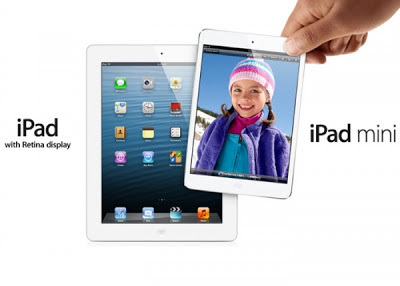 18-19 million regular iPads (3rd/4th Gen iPad & iPad 2) and 6-7 million iPad Minis. Other than Samsung and Amazon etc., that refuse to release sell through sales figures, who cares about shipments other than if making an argument for lower than expected sales due to supply constraints. Apple reports shipments in their quarterly results, not sales. The tech media has been extremely irresponsible with this. 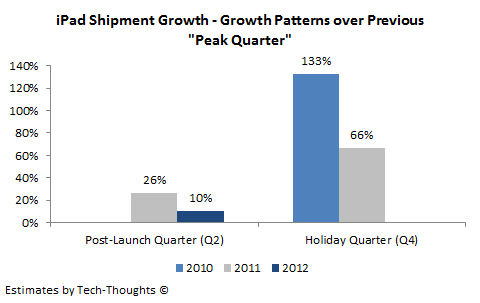 Shipments are a leading indicator for sales, as long as there's no sequential crash. And no company will report shipments of a subsidiary (Samsung) or of a non-core business (Amazon). Pure OEMs like Asus do report shipments. Analisys that can make sense if the assumption are correct. 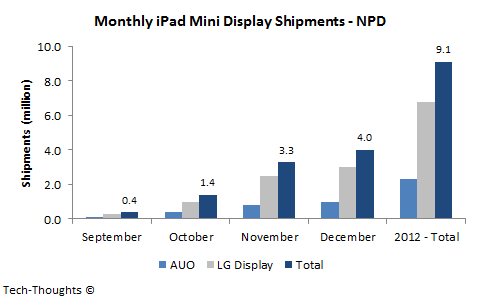 third assumption: Shipment of the Ipad in q3 declined because of the MIni Coming. This isn't a fact! May be, just may sales were really declining, forcing AAPL to release a new IPAD as well, in order to cut the price of the actual ones to try to increase audience ? In conclusion, if you Ipad mini are correct, I will look at something like 21 Million as the top figures. To be honest, those arguments don't hold much water. 1. I'm making an estimate for Q4 2012, not 2016. Global tablet penetration is still abysmally low. We're not talking about a saturated market here. And keep in mind, my previous market share projection predicted a decline in the iPad's market share going forward, meaning the iPad's sales will grow, but competing products will grow faster. In any case, it is true that the iPad's growth will tail off going forward (and I've already taken that into account). 2. Most iPad sales (or tablet sales for that matter) are limited to WiFi versions. 4G isn't as big a factor as Apple makes it out to be (at least for tablets). Therefore, carrier support has very little impact on tablet sales. In fact, to add to my point, I would argue that the only risk for the iPad's shipment growth (not market share) is further cannibalization, i.e. the possibility of further delayed purchases in light of low availability of the iPad Mini. That's more difficult to gauge. We will see, Sameer. I got a good knowledge in the european channel. May be US will surprise me.